I started doing an annual recap of my favorite eats a few years ago, and it's a blog entry I've always enjoyed writing. It's like looking at a yearbook, but without the "See you next year! Never Change!" crap. Whether it was dope desserts, or awe-inspiring seafood, or out-of-this world cheese, the best part of my meals was the company - my dashing husband Gerg. The worst part was that I didn't take the time to blog about most of these meals. I wrote a lot for my day job this year, and I had a blast writing for Minnesota Monthly, but I didn't blog about dining at Tru or Topolobampo, and I went bananas at both joints. My resolution this year is to blog more about good food right here at Reetsyburger's Refuge. - A Dessert-Only Tasting at Tru in Chicago. 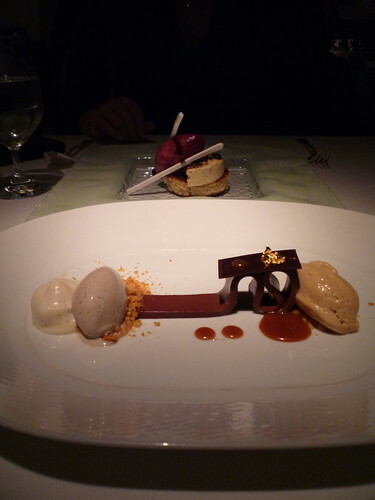 This is when they still had their deconstructed chocolate bar dessert on the menu (pictured above). Milk chocolate cream topped with tempered dark chocolate, served with coffee ice cream, caramel mousse, and malted caramel. The tasting also included such indulgences as chocolate-whisky lollipops, passionfruit pâte de fruits, cannelés, macarons, miniature root beer floats, and fruity lollipops as we exited. So gangster. - The #5 at Black Sheep Pizza. A 12" fennel sausage, hot salami, onion, and cracked green olives pizza with a side of their tangy marinara paired with an alluring glass of Surly Smoke. - A 1/4 lb of Hook's 15 Year Cheddar with some honeycrisp apple slices and a couple glasses of Hess Collection '19 Block Cuvee' while keeping it real around the island in our kitchen. - The Ceviche Trio at Topolobampo in Chicago. Ceviche Fronterizo (blue marlin with lime), Ceviche Yucateco (shirmp and calamari with lime and orange), and Ceviche de Atun (ahi tuna with red chile apricot salsa). They also had killer Mexican hot chocolate. - The Butterscotch Panna Cotta with Seasame Seed Brittle at Parma 8200. It doesn't get better than chilling a on patio with butterscotch decadence under the moonlight on gerg's birthday - with Shannon S. as our server. - Pan-seared Sea Scallops served with a Surly 2010 Smoke "beer" blanc at Cafe Twenty Eight. It was a special, not a regular menu item. I yapped about those scallops for at least 20 minutes in the car. - The Cajun Grouper Sandwich at Frenchy's Salt Water Cafe at Clearwater Beach, FL. Fresh, tender grouper, seasoned perfectly on a bun. It certainly helped that it was December and we were kicking it at the beach while a snow emergency raged in Minneapolis. - The Soft Eggs and Lobster Bruschetta at Bar La Grassa. The soft egg and lobster alone is worth a visit to Bar La Grassa. The Star Tribune even snagged the recipe for us! - The Blueberry Pancakes at Al's Breakfast. I'd never even attempt to get a spot at Al's on a weekend, but what's more fun on a day off that a fun, kitschy breakfast joint with bomb blueberry pancakes and lots of coffee? - An 8 course Tasting at Victory 44. The meal was not planned. We stopped in for a quick bite during the week, but 2 hours later, and 8 courses later, an epic meal had taken place. And while I never blogged about the night, I did write everything down! Here's all that we were served: 1) Sweet potato soup with candied walnuts, 2) Crispy mashed potato fries with bacon, salt, and fennel, 3) Beef carpaccio with red onion sunchoke parsnip fennel escaviche paired with Les Trois Couronnes coates du rhone, 4) Leek soup with beet and honey foam paried with a Trentadue zinfindel blend, 5) Truffle froth mushroom powder porcini angolotti paired with a Stephen Vincent cabernet blend, 6) Scotch egg with pickled radish and onion aoli paired with an Alta Vista malbec, 7) House made chorizo with fried polenta and a demi with scallop and bacon paired with a Nero D'avolo villa pozzi, 8) Dessert Plate: Marshmallow fluff brittle brownies, a brownie with hazelnut butter, some chocolate mousse, a semi fredo cookie, a cheesecake noodle, a chocolate cake with cherry caramel, and tres leches. All paired with Henkel Cuveé Brut. - Punch had a serious salad special one night. It was a plate of arugula and a ball of burrata with cracked pepper and sea salt. - A juicy, grassfed beef burger at The Inn. - The King's Breakfast at King's Wine Bar. best overhard fried egg I've ever had. .
- Countless bowls of Pho at Pho 79, Quang, and Ngon Vietnamese Bistro. - Food made by friends: Shannon's BLTs, Sarah's German Chocolate birthday cake, David's Boeuf Bourguignon, Aimee's chocolate torte, Monica's potato salad, Jason's lamb, Dan's ham, and so much more! been a crazy year, huh?! don't go changing...let's really blow this place up next year! WOOT!